I really looked forward to seeing this film, even though I missed it at my local theater. When I picked up the DVD, I was ready to grab my popcorn and soda and enjoy. Unfortunately, I really was terribly disappointed. 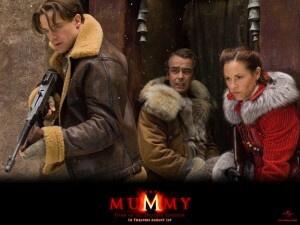 With the change in writers, director, and even leading lady, the whole Mummy concept just went down the drain. There wasn’t even the exotic presence of Oded Fuhr (which would have been stretching his place in this particular concept), who played one of the magi guarding the location of the Egyptian mummy, to keep this one breathing. Director Rob Cohen (Dragonheart, Skulls) and writers Alfred Gough and Miles Millar (the team who wrote Spiderman 2 and several Smallville episodes) placed our dauntless heroes, Rick O’Connell and his spouse, Egyptology Evelyn O’Connell, on a trek to China and Tibet to stop the reanimation of Emperor Han, the first emperor of China, who has been placed under a curse that has turned him and his army into terra cotta statues. Brendan Frazer reprises his role as Rick O’Connell, but he appears to have degenerated since our last encounter with him in The Return of the Mummy, where he had developed some poise and put down roots. Here, he appears to be clumsy and juvenile. The most striking change is in the casting of Maria Bello as Evelyn O’Connell. Bello has appeared in many episodes of ER, but was also in major films such as The Jane Austen Bookclub, The Dark, and Flicka. A capable actress, she is just miscast in this role. Previously, audiences have seen Evelyn, played by Rachel Weisz, develop from a clumsy, naive, bookish librarian who wants to become a true archaeologist to a confident, sophisticated professional who taps the hidden jmartial arts skills of a past life to meet the challenge of the mummy. The writers introduced Bello at a book reading where a fan asks her if her fictional character is based on Evelyn, and she raises her head so the audience can see her face and sheEvelyn replies, “No. I can honestly say she is a completely different person.” It’s clever, but it doesn’t save the role. Bello just doesn’t communicate the charm Weisz had in the role and her ability to play it straight with couched humor. Even Bello’s doting on grown son, Alex, played by Luke Ford, comes off smothering and out of place, instead of endearing. The introduction of a grown son, following in the father’s footsteps, echoes that element in the latest Indiana Jones film. Ford, whose experience has been mainly in television, does a great job as the next generation adventurer. I think it works because his role is played straight without any comic effects. Then, there’s the plot. Though several films and television shows have used the Chinese terra cotta soldiers as a plot element, here it just went wrong from the start. First of all, the terra cotta army wasn’t discovered until1979 (not the late 40s), and it was the first emperor of China not the last he is sometimes referred to in the script, though early on during the prelude, a narrator does identify the tomb as that of the first emperor to unit all of China. The actual tomb, today, remains unopened, in the hope that it will remain intact. Only a portion of the site is presently excavated. And, indeed, this first emperor was buried with warriors, chariots, horses, government officials, acrobats, strongmen, and even musicians. An early Chinese historian reported that there were also supposed to be palaces, scenic towers, valuable utensils and 100 rivers flowing with mercury. Now, that would have made for an interesting story. I could have dealt with the fact that the tomb was found and later reburied and lost, as happened a lot over history, especially in Egypt. But this is a unique find, and the O’Connell’s with some supernatural help destroy a lot. Now, how could it be found later? Then, there is the fact that Egyptology Evelyn O’Connell knows all about ancient Chinese tombs. That’s a pretty big reach. During this early era of archaeology, when scholars specialized, they specialized. There just wasn’t the access to cross discipline information as we have today. Jet Li plays the resurrected Emperor Han. It’s another action flick for him and offers him nothing to develop as an actor but to show off his martial arts skills. Accolades go to Chinese actresses Michelle Yeoh (Crouching Tiger, Hidden Dragon) and Isabella Leong, who play the sorceress (who cursed Emperor Han) and her daughter, and, John Hannah who reprises his role as Evelyn’s wayward brother. For those new to the Mummy franchise, go see the film. It’s a good adventure story. For devoted fans, be prepared to lower your expectations.